In a press conference reflecting on last week's massacre in Newtown, Conn., the National Rifle Association's Wayne LaPierre today called on Congress to put armed law enforcement agents in every American school, insisting that guns in schools -- not tougher gun laws -- would most effectively protect children from school shootings. LaPierre, who did not take any questions and whose remarks were interrupted twice by pro-gun control protesters, disdained the notion that stricter gun laws could have prevented "monsters" like Adam Lanza from committing mass shootings, and wondered why students, unlike banks, don't have the protection of armed officials. He also called for a "national database of the mentally ill."
Twenty first-grade students were gunned down at their Connecticut elementary school last Friday, when 20-year-old Lanza reportedly opened fire in the school. Six adult faculty members were killed in his rampage, and Lanza also took his own life. Shortly before entering Sandy Hook Elementary School, Lanza is believed to have killed his mother, Nancy Lanza, in her bed. In the aftermath of the shootings, there has been much speculation as to the state of Adam Lanza's mental health, but no concrete evidence has been established that he was mentally ill. In the aftermath of the shooting, the NRA stayed largely silent, making only a brief comment earlier this week when announcing today's press conference. In his remarks today, however, LaPierre vehemently defended the pro-gun agency against critics and offered up a solution of his own. "We must speak for the safety of our nation's children," said LaPierre. "We care about our money, so we protect our banks with armed guards. American airports, office buildings, power plants, courthouses, even sports stadiums, are all protected by armed security. We care about our president, so we protect him with armed Secret Service agents. Members of Congress works in offices surrounded by Capitol police officers, yet when it comes to our most beloved innocent and vulnerable members of the American family -- our children -- we as a society leave them every day utterly defenseless. And the monsters and the predators of the world know it and exploit it." "That must change now," argued LaPierre, moments before being interrupted by a protester carrying a large pink sign proclaiming that the "NRA is killing our kids." "The truth is that our society is populated by an unknown number of genuine monsters -- people so deranged, so evil, so possessed by voices and driven by demons that no sane person can possibly ever comprehend them. They walk among us every day. And does anybody really believe that the next Adam Lanza isn't planning his attack on a school he's already identified at this very moment?" Alternately criticizing politicians, the media, and the entertainment industry, LaPierre argued that "the press and political class here in Washington [are] so consumed by fear and hatred of the NRA and America's gun owners" that they overlook what he claims is the real solution to the nation's recent surge in mass shootings -- and what, he said, could have saved lives last week. "What if, when Adam Lanza started shooting his way into Sandy Hook Elementary School last Friday, he had been confronted by qualified, armed security?" he asked. "Will you at least admit it's possible that 26 innocent lives might have been spared? Is that so abhorrent to you that you would rather continue to risk the alternative?" LaPierre called on Congress to put a police officer in every school in America, which according to a Slate analysis would cost the nation at least $5.4 billion. LaPierre recognized that local budgets are "strained," but urged lawmakers "to act immediately, to appropriate whatever is necessary to put armed police officers in every school." He offered up the NRA's unique "knowledge, dedication, and resources" to assist in efforts to train those forces, but made no mention of a fiscal contribution. Columbine High School employed an armed guard, Neil Gardner, at the time of the 1999 school shootings. According to CNN, Gardner was eating lunch in his car when violence broke out in the school, and 13 people were killed. Gun control advocates immediately decried LaPierre's comments, and New York City Mayor Michael Bloomberg called the press conference a "shameful evasion of the crisis facing our country." "Instead of offering solutions to a problem they have helped create, they offered a paranoid, dystopian vision of a more dangerous and violent America where everyone is armed and no place is safe," he said. "Leadership is about taking responsibility, especially in times of crisis. 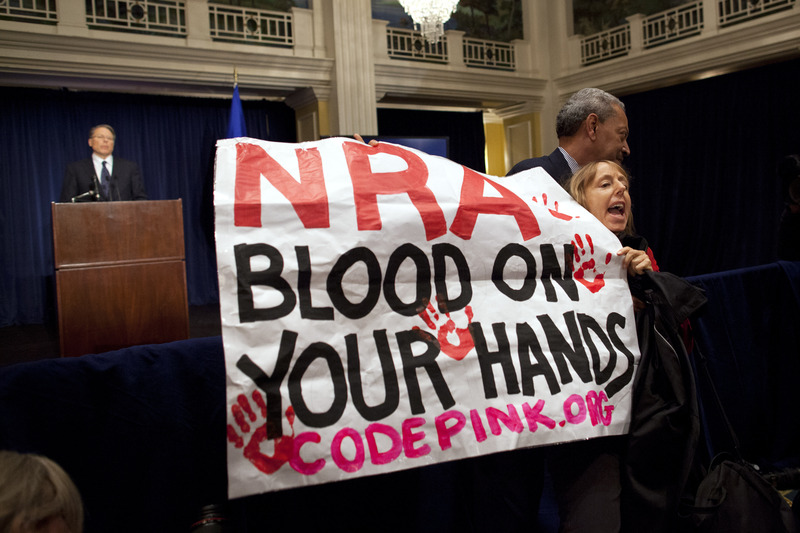 Today the NRA's lobbyists blamed everyone but themselves for the crisis of gun violence." On Twitter, Senator-elect Chris Murphy, D-Ct., called LaPierre's comments "the most revolting, tone-deaf statement I've ever seen." The Obama administration has yet to release its own policy proposal in the wake of the Sandy Hook shootings, but announced this week the creation of a task force aimed at providing actionable ideas to prevent or reduce gun violence in America. Sen. Diane Feinstein, D-Calif., called the NRA's response a distraction meant to delay Congress from enacting legislation. "Should we have a conversation about school security? Yes. Should we have a conversation about mental illness and the culture of violence? Yes. But we can't ignore the common denominator in all of these deadly massacres: Access, easy access to killing machines," said the senator, according the CBS News correspondent Chip Reid. Vice President Joe Biden, a key author of the 1994 Assault Weapons Ban, will helm the task force, and cabinet members and outside groups will be called on for ideas and contributions. In remarks announcing the task force, Mr. Obama stressed that "this won't be some Washington commission" that takes six months to study the problem and write a report that goes nowhere. He insisted that he wants ready-to-act concrete recommendations on the "complex issue" in January. Many believe that in the wake of the tragedy, the political will to reinstate the Assault Weapons Ban, which expired in 2004, will increase. The president long has supported such a ban, but exerted little effort to get it passed during his first term. According to White House spokesman Jay Carney, Mr. Obama also would support closing a "gun show loophole" allowing people to buy arms from private dealers without background checks, and would be interested in legislation limiting high-capacity ammunition magazines. Even while the president has acknowledged the political difficulties associated with gun laws, he said this week that the complexity of the problem "can no longer be an excuse for doing nothing." Unlike in the cases of previous mass murders, new evidence suggests Americans increasingly support tougher gun control in the wake of the Newtown massacres. According to a recent CBS News poll, support for stricter gun laws is the highest it's been in a decade, surging 18 points since the spring of this year. According to that poll, conducted Dec. 14-16, 57 percent of Americans now say gun control laws should be made more strict. That's up 10 points from January 2011 -- following the shooting of then-Rep. Gabrielle Giffords in Arizona -- when a CBS News poll found that 47 percent of Americans backed stricter gun laws. In April of this year, just 39 percent of Americans supported stricter gun laws. In a statement today, Daniel Gross, the president of the Brady Campaign to Prevent Gun Violence, urged NRA members to "join us" in fighting to end gun violence. "To the 74 percent of NRA members who support requiring a criminal background check of anyone purchasing a gun...To the 87 percent of NRA members who believe that the 2nd Amendment can coexist with efforts to keep illegal guns out of the hands of criminals... To all NRA members who believe like we do, that we are better than this, we send this message... Join us," he wrote. "Join us in making sure the gun violence ends now. We are all Americans and we all agree we are better than this."